While Rolex have long integrated diamonds and gemstones to their horological masterpieces, it was only in 2012 that the 40mm Cosmograph Daytona received a colourful coat. The previous versions of the 40mm “Rainbow” Daytona, including one in yellow gold and one in white gold, have become the luxury watchmaker’s most striking and beautiful watches to covet by collectors. Furthermore, it is as popular with Rolex’s base of male clients as with its women’s, thanks to its unisex appeal — beautiful watches clearly have no gender. On the newest version is 18k Everose gold, a proprietary rose gold alloy developed by Rolex that’s resistant to fading. But what makes it truly a prism of a watch is that its bezel is adorned with coloured gemstones, including 36 baguette-cut sapphires in rainbow hues. Upping its glitzy ante, the case comes with 56 brilliant-cut diamonds set into the lugs and crown guard. And if you think that’s just about enough bling, Rolex says “more is more” by adding 11 baguette-cut sapphire hour markers, each of which matches the colour of the corresponding point on the bezel. Sub-dials of the chronograph are rendered in pink gold crystals, a material that has undergone a crystallisation process to give it a shimmering finish. And what’s inside a rainbow, you ask? This one has the standard calibre 4130 chronograph movement found in all Daytonas. While many of this year’s most beautiful watches, including the new Rolex “Rainbow” Daytona, unveiled at Baselworld 2018, Dior’s departure from the fair this year meant the Maison had to release its new Dior Grand Bal Jardins Imaginaires collection, which encompasses 10 unique watches, at its own exhibition in Paris. The collection celebrates Monsieur Christian Dior’s love of flowers and gardens. And the pièce de résistance is definitely the 36mm Dior Grand Bal Pièce Unique Jardins imaginaires No. 6, which blends the beauty of both horology and horticulture in one spectacular masterpiece. 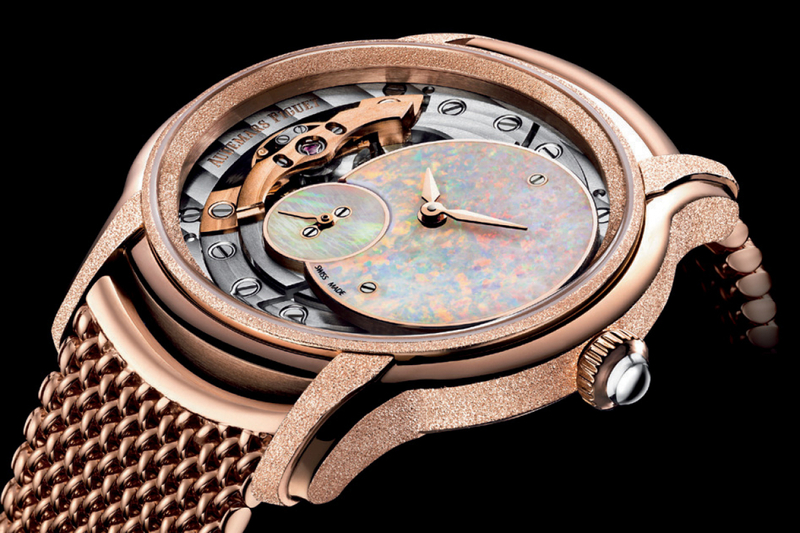 Its dial is engulfed in a flora and fauna of opaque polished pink gold metallisation and precious gems. Delicate petals of round rubies as well as a butterfly wing decor leave no room for hour markers or Arabic numerals, only its yellow gold faceted hour and minute hands to fully indicate the time. The crown is paved with snow-set round diamonds while the pink gold case comes further peppered with round diamonds in a beautiful devoré setting. The watch is equipped with the brand’s exclusive “Dior Inversé 11 1/2” calibre and functional oscillating weight placed on top of the dial which drive the timepiece. The Millenary by Audemars Piguet, with its horizontal ovoid-shaped case, was first introduced in 1995 but it really made collectors sit up and take notice 20 years later, as the brand launched a slightly more refined design packaged with a new hand-wound Manufacture calibre 5201. In 2018, at SIHH in Geneva, the new Millenary collection continues to appeal with its blend of eccentric dials and technical savoir-faire. The exposed workings of the now-standard in-house caliber 5201 is still visible through the front of the watch. Two out of the three new Millenary models come in pink gold or white gold with mother-of-pearl dials and diamond-set bezels. But it is a third addition that’s been crowned the beauty queen. Save the fact that it features an 18k pink-gold case exquisitely finished in Frosted Gold on the case sides, bezel, inner bezel and lugs. To raise the roof, opal has been utilised to make the dials — an hours and minute one set off to the side and a small seconds dial located at the main dial’s 8 o’clock. The fragile stone is exceptionally challenging to work so only the most precious opals were selected for their vivid iridescence. Matching the case metal is a beautifully crafted bracelet in the classic Polish style, with a supple mesh that’s been said to fit the wrist like a second skin.